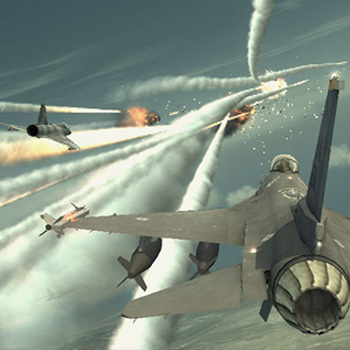 Online for the first time, via Xbox Live, players can experience Ace Combat 6: Fires of Liberation on a massive worldwide scale as it features an in-depth multi-player online experience that includes a variety of action-packed online modes. Players fight alongside fighter planes, gun ships, attack helicopters, tanks, naval fleets, heavy bombers, and electronic warfare vessels in the ultimate Ace Combat showdown. The Dynamic Operation System provides for massive battles unfolding on a "living battlefield," as up to six independent land, sea or air conflicts can break out at any time at multiple locations as allies and enemies clash in real-time. Players can experience the realism of war when battlefields come alive with engagingly authentic audio and visual effects: thundering explosions, dense vapor trails of air to air missiles, piercing machine gun fire, booming anti-aircraft artillery fire, mid-air explosions, gigantic columns of black smoke and more. Players can prove their supremacy on a global scale as they pilot highly detailed, authentic aircraft such as the F-15 E Strike Eagle and the F-22 Raptor online via Xbox Live. For an all out worldwide battle for the sky, players can choose from a variety of different online modes including the death match and team death match style game modes. Or they can team up with friends to play in co-op, where players combine strategy and skill to work together to take on computer-controlled adversaries. Online rankings are calculated globally with high-ranking players being granted honorable titles on a global scale, adding fuel to the fires of furious competition.